Home > Certifications > CDR FoodLab® method for the determination of Lactose content in lactose-free dairy products. Nowadays lactose-free diary products are gaining an ever bigger stake in the market, due to the increase in lactose intolerance in adult population. For this reason lactose determination in lactose free products appears more and more as an important analisys for producers, both at line and as a final quality control on the finished dairy product. In this work a new improvement for lactose determination is assessed in terms of reproducibility, accuracy and recovery. New method and traditional enzymatic method are also taken into comparisonon adding determined aliquotes of lactose in reallactose-free matrices. The new method appears to be much quicker and with a friendly use for everyone if it is compared to the tradional enzymatic kit. Download the full paper CDR FoodLab method for the determination of Lactose content in lactose-free dairy products. Lactose is the main sugar molecule that can be found into milk. It is a disaccharide, formed by D-galactose and D-Glucose. The two monosaccharides can be liberated during digestion by lactase (b-galactosidase), an enzyme found in gastric juice that can promote lactose hydrolisys. The lactase is the enzyme added in the delactozation process that removes the lactose from milk. The monitoring of this process and the final lactose concentration are two important steps that have to be carefully controlled. Also the concentration in the finished dairy products such as for instance cream, yogurt or cheese has an high importance for the quality control. Then, lactose determination seems to be a crucial analysis for the internal quality control laboratories and for the monitoring in real-time of the delactosation process in dairy industry. 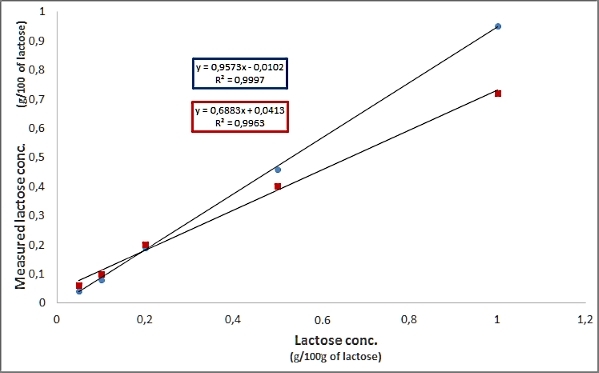 The traditional enzymatic method for the determination of lactose in food matrices is based on photometric measurements of the evolution of NADH after lactose digestion by means of lactase enzymes. The sample preparation and analysis consists in various steps and could be considered very time consuming for the ordinary quality control. First of all the samples have to be treated using a basic sodium borohydride solution at controlled temperature (40°C) for about 30 minutes and then the sample has to be filtered or centrifuged (depending on the fat/protein content in it). For the analysis step two different cuvettes for each sample have to be prepared, in order to quantify precisely the lactose content. On both cuvettes three different reagents have to be added and an incubation time of 2h (for free-lactose samples) is mandatory. The final lactose content is determined photometrically by NADH evolution after two stages of enzyme digestion. Prior and during the test various sample dilution steps are needed to obtain a certain lactose content in the cuvette. This can force the user to perform various subsequent tests, in order to optimize the procedure (expecially for unknown lactose samples). For all these reasons, the lactose determination with the common commercial kits appears to be very time consuming and furthermore the analysis must be carried out from people with high chemical skill. CDR has developed a new easy method for the determination of Lactose content in lactose-free dairy products in 10 minutes with the analysis system CDR FoodLab® for milk and dairy products. CDR FoodLab® analyzer is based on photometric technology, equipped with LED emitters, reading cells and 37°C thermostated incubation cells. The using of this specific emitting technology allows to perform analysis on milk or dairy process without the long clarification process used by normal photomethers equipped with standard tungsten lamps. CDR FoodLab® method for lactose determination uses a reagent in pre-filled cuvette. You can perform the test in 10 minutes. Various samples can also be analyzed at the same time due to the versatility of the CDR methodology. All reagents are supplied ready to use, then operators do not have to handle toxic or carcinogenic compounds. There is no need of a dedicated laboratory or to wash either containers or traditional glassware because CDR FoodLab® analysis system allows to perform test on samples in total autonomy. Thanks to its easiness also people without chemical skill are able to carry out this test in total autonomy. 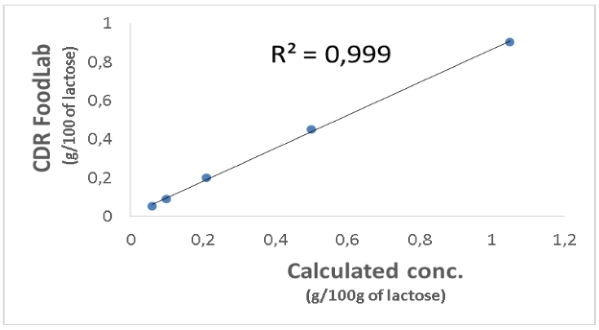 In the graphic below you can see the correlation between CDR FoodLab® results and theoretical calculated concentrations of lactose in spiked samples. Both the CDR method and the traditional method with enzymatic kit were employed to measure lactose content in a series of samples obtained cutting delactosate milk with different amounts of undelactosated milk. It can be seen how in the traditional method, despite showing a good correlation, displays lower lactose concentrations in respect to the calculated ones. This can be probably attributed to the errors introduced by the various diluition steps needed to perform the analisys. The results obtained demonstrate that CDR FoodLab® is a method able to quantify total lactose content in real samples in a fastest but yet accurate way in respect to the traditional method. CDR FoodLab® is a versatile system specifically developed by CDR to respond to the needs of milk and dairy products producers. CDR FoodLab® analysis system allows to perform tests with one single instrument, more rapidly and easily than traditional methods. CDR FoodLab® method for the determination of Lactose content in lactose-free dairy products. was last modified: May 9th, 2017 by CDR s.r.l.